Ingredients: If you liked the drama of Interview with a Vampire, the special effects of Priest and the campiness of Van Helsing, then you will like this movie. After seeing Dark Shadows, I was dreading watching another new Tim Burton film but Mr. Burton pulled a fast one on me by having Abraham Lincoln: Vampire Hunter be a pretty cool flick. The movie is actually an adaptation of the book with the same name; a very ‘loose’ adaptation. The book, Abraham Lincoln, Vampire Hunter, is part of this very odd sub-genre of novels involving mashing up other people’s writings or realistic accounts with elements of the supernatural. (Examples being Pride and Prejudice and Zombies, Sense and Sensibility and Sea Monsters, and so on.) 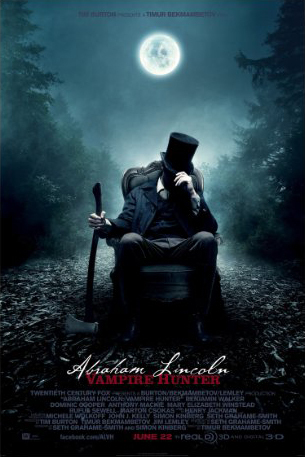 As the title implies, the movie is indeed about Abraham Lincoln hunting vampires but unlike the title implies, the movie is a lot more serious and genuine then you would think. The film takes us through the life and times of Abraham Lincoln (as played by Benjamin Walker). Lincoln is depicted at a young age as being a man that wanted to fight against injustice and, driven by revenge, finds the two most unjust things in the United States around the 1850’s happen to be slavery and vampires. Lincoln is saved from a vampire attack and taught how to hunt the blood suckers by his mentor, Henry Sturgess (Dominic Cooper.) When it is revealed that the powerful father of all vampires in the United States, Adam (Rufus Sewell), is planning to make North America a nation of vampires, Lincoln puts away his vamp-killing axe and takes up the mantle of President to stop him. I really liked this movie. All of the supporting cast was spot on and the movie did a terrific job explaining the vampire mythos, including why the undead were able move around in the daylight. But there was more to it then that. Sure it’s partly another schlocky vampire movie but its also a nice representation of Lincoln as a man and a leader. Of course I’m not saying it’s historically accurate in the least, my mind’s not nearly that far gone. What I am saying is the movie has a great deep-rooted symbolic message. The reason the vampires were growing so comfortable in the early years of the United States is because they feed on the one group of people that no one in authority cared about, slaves. The film turns the metaphorical image of slavery and slave ownership -- the cruel and powerful benefiting from the labors of the weak and helpless -- and acquaints it to the actual act of vampirism. The vampires were depicted as more then just movie monsters, they were man’s ‘bloodthirsty’ ambitions made flesh. The movie actually works in the message that Lincoln’s goal was not just to save humans from vampires but to save the very “soul” of the country. It was just nice to see a movie that could subtly work in a critique on the U.S.’s history without beating the audience over the head with it. But enough of that deep analysis phooey, lets talk about the action! The action scenes were, for the most part, very impressive. The scenes that showed Lincoln as an everyday man and narrated his slow rise to the Presidency were great for building suspense between vampire fights. And the fact that you were watching the soon to be 16th President chop the limbs off an undead horror was strangely thrilling. There were a few scenes that were way too out of place with their goofiness in comparison with the rest of the flick and there’s a gratuitous amount of slow motion in every fight scene. But there were also some spectacular moments, as well. Lincoln’s wife, Mary Todd (Mary Elizabeth Winstead), gets a pretty awesome moment. As does Lincoln’s friend, Joshua Speed (Jimmi Simpson.) When I first heard about Tim Burton making a movie about Abraham Lincoln living a double life as a vampire hunter, I thought it would be a huge mess. Thankfully, I was proven wrong and I recommend Abraham Lincoln: Vampire Hunter for those lovers of the supernatural action thrillers.